I’ve spent much of my adult life (going on 20+ years these days) struggling with a desire to be vegetarian. Not because of a moral indignation (although I do appreciate that point of view). Not because of the obvious health benefits (the rate of cancer in vegetarians is significantly lower than that of meat-eaters). But rather, because yoga and meditation is way easier on a vegetarian diet. It’s easier to be flexible. It’s easier to be open. At least, for me, it is. I had a teacher explain once that eating meat can block your “tenth gate.” Which is probably a conversation for some other time. Plus … I always kinda felt like touching raw meet was kinda gross. After giving birth to our son, I ended up a little on the anemic side. It’s amazing what we’ll do for our kids, right? I successfully avoided making a roast chicken (or turkey) for more than 40 years. But I wanted to find a natural (unbinding … TMI? sorry … it’s true … supplements are “binding”) way to increase the iron in my system. Which means finding digestible ways to absorb iron in our foods. So I started cooking more in cast iron pots and pans (the iron absorbs into the food … isn’t that crazy?). Eating a lot more dark leafy greens (like kale and spinach). And I ultimately added meat back into my diet. Specifically … bone broth … homemade and iron fortified (because no matter the brand, store-bought is way less nutrient-dense, and sort of flavorless). 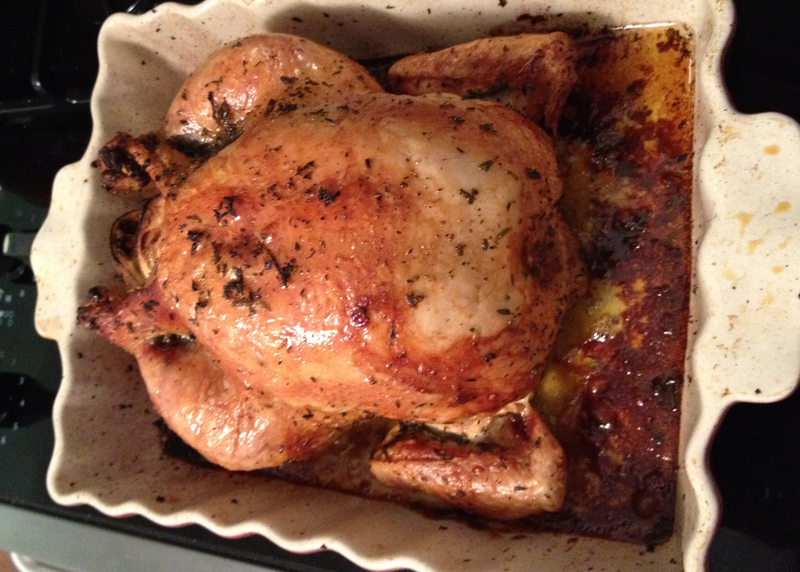 Because the first step to great bone broth is a good roast chicken. So today’s all about roast chicken. And if you think anything like the way I used to, you might assume that roasting a chicken is complicated. Wow, was I surprised to learn that that’s the farthest thing from the truth. And requires about 10 minutes of active cooking time. And tastes WAY better than the chicken you might pick up at Safeway. Plus you’ll know what’s IN your chicken and where the ingredients come from. 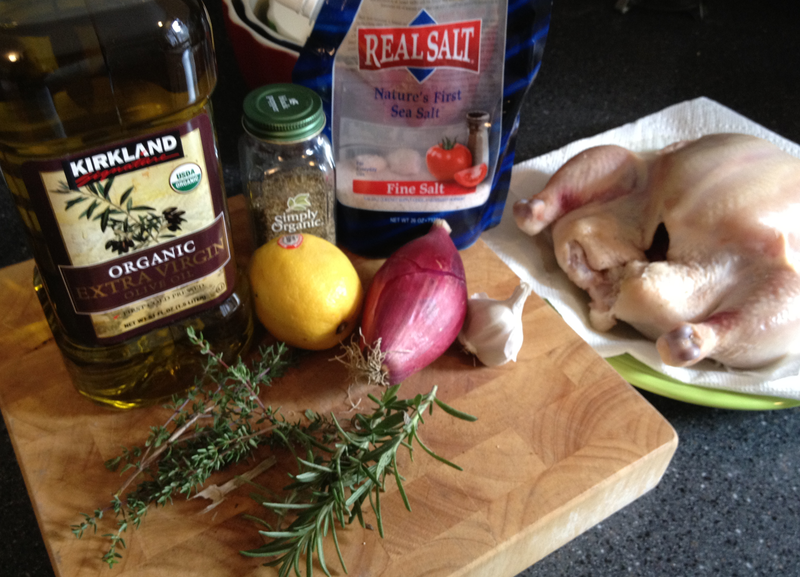 Also, it doesn’t require a lot of ingredients to make a tasty, juicy, nourishing bird … that even I like for dinner. Plus … on an economic note … two 5-lb organic chickens at Costco sell for about $20. These two birds produce enough goodness for about 4 meals for our family of four … plus 8 pints of bone broth … and the leftover meat, veggies and bones in the broth are a great treat for the dogs … so very little goes to waste. In a small bowl, mix together olive oil, rosemary, thyme, half of the salt and all of the pepper. Has any more water seeped out of your chicken? Pat it down again! Seriously … the patting is KEY to our success! Now that it’s good and dry, stuff the cavity with your onion, lemon and garlic. There’s no need to truss this bird, if you don’t have string … what I generally do is cut small slices in the neck flap (how gross does that sound? whew. deep breath.) and put the legs through the hole to keep ‘em contained. 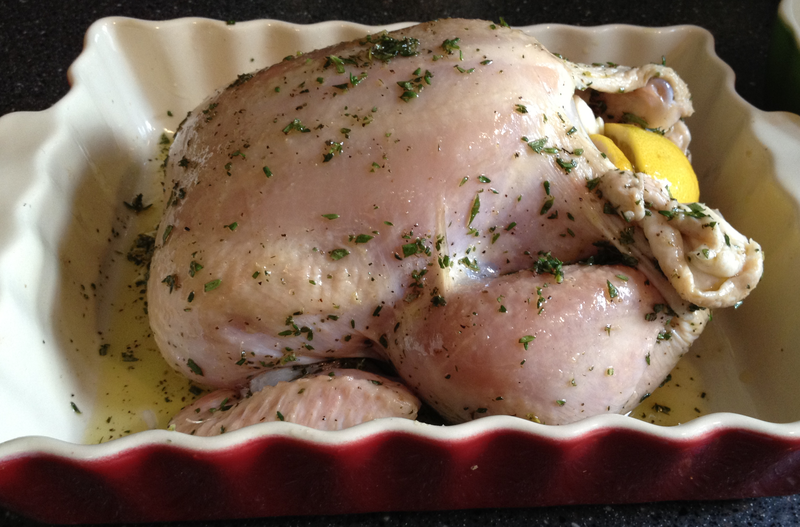 Rub the chicken down with the oil and herb mixture … rub it good … on all sides. Put the bird in your roasting pan, tuck the wings under so they don’t burn, sprinkle the bird with the remaining salt, and pop it in the pre-heated oven. About 65-75 minutes later, the internal temperature reaches 165 degrees and it’s good to go. Take it out of the oven and wait about 15 minutes before cutting into it … letting it rest is another key to juicy chicken. You can serve this however you like … with veggies … over quinoa … roasted potatoes or a salad … you can put it in your fridge and pick at it for the next few days … whatever you like. Just enjoy it … at the very least, pat yourself on the back for roasting your own bird! We’re linked up on This Chick Cooks and The Nourishing Gourmet. your roast chicken looks perfect!